You are here: Home / Blog / Remember When Hunter S Thompson and Conan O’Brien Shot Assault Rifles Together? 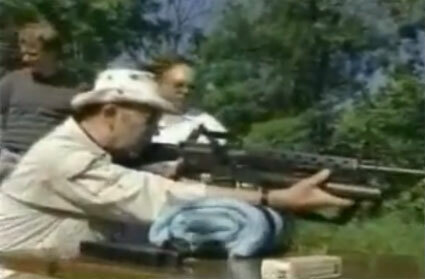 Remember When Hunter S Thompson and Conan O’Brien Shot Assault Rifles Together? In honor of Conan O’Brien’s new show launch tonight I felt this was a timely look into the ghost of televsion past. Back in the day Hunter S Thompson made a few appearances on the Conan O’brien show. During one of these episodes Conan met him at a shooting rage where they spent the day drinking and firing off high-powered assualt weapons. Targets included cardboard stand-up displays and stuffed animals. Here’s a clip that shows a few scenes from said episode as well as him telling some awesome tales. Letterman never did anything this rad.